That modern convenience, however, is denied to wine lovers who live in the 36 states that prohibit interstate shipping from retail wine shops. A consumer in a rural community, for example, with few good wine shops within easy reach, is forbidden to order wine from an out-of-state source with great bottles galore. This may change in the not-too-distant future. A case to be argued before the United States Supreme Court on Wednesday may decide whether states can prohibit retail wine shops from shipping to consumers in another state. A ruling might even affect access to small-production beers and spirits, although it’s not clear whether it would extend beyond wine. The case, Tennessee Wine and Spirits Retailers Association v. Blair, does not hinge directly on the issue of interstate retail sales. It instead is focused on the effort of Total Wine & More, a national retail chain of almost 200 stores, to open an outlet in Tennessee. A group of retailers in the state sued in an effort to block the move, arguing that Tennessee law required the retail owners to be residents of the state. Yet the court’s decision, many believe, will have major implications for interstate wine sales. It could open a wellspring of opportunities to consumers, allowing wine lovers to scour the country for hard-to-find bottles and the best retail deals. Or it could put to rest any further effort to broaden access to fine wine. “We’re about 90 percent sure it will affect interstate shipping,” said Daniel Posner, the managing partner of Grapes the Wine Company, in White Plains, N.Y.
Mr. Posner is the president of the National Association of Wine Retailers, an advocacy group, which has filed a brief with the court in Blair arguing that the right of wine producers to sell and ship bottles to out-of-state consumers, granted in a 2005 case, Granholm v. Heald, should be extended to retailers. The Granholm case struck down state laws that permitted wine producers to ship bottles directly to consumers in that state and barred out-of-state producers from the same practice. In-state and out-of-state producers must play by the same set of rules, the court said. But the Granholm ruling was vague about whether it applied to retailers as well. Before the early years of this century, ordering wine from out-of-state merchants was a minor part of the business, and drew little attention. 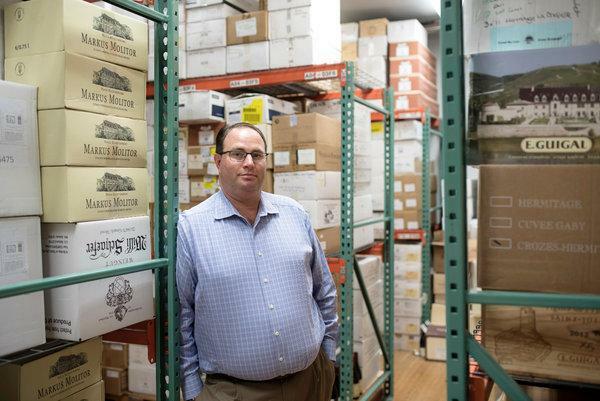 Only the most committed collectors, who sought access to out-of-state wine catalogs, would go through the inconvenience and expense of such transactions. High-speed internet changed everything. With easy access to retail websites, consumers anywhere in the country could order from specialty wine shops, purchasing bottles that might otherwise be unavailable in their own states. Given the irrational patchwork of regulations that governs wine distribution, every state essentially offers consumers a different selection of wines. For people who live in areas rich with fine-wine retailers, internet shopping was an added bonus. For those in areas with few retail options, it was a savior. As consumers became accustomed to shopping on their computers, interstate sales became a more significant part of the business for retailers, enough so to draw the attention of wine-and-spirits wholesalers, who felt themselves bypassed by such interstate sales. While the Granholm decision did not specifically grant retailers the right to sell wines out of state, it did not prohibit it, either. The national retailers association — along with other proponents, including a group of 81 consumers, which also filed a brief in the case — is hoping that the court’s Blair decision will extend those rights explicitly to retailers. “As with a lot of Supreme Court cases, there’s an issue that’s squarely before the court, but there are other issues that the court will have to sort through in making a decision that will have a lot of implications,” said Paul D. Clement, a lawyer who filed the brief on behalf of the national retailers association. The original ruling in the Blair case, by a federal district judge, was in favor of the Tennessee retailers association, which had defended the state residency requirement. But that was overturned in early 2018 by the United States Court of Appeals for the Sixth Circuit, which cited Granholm in ruling that in-state entities could not be favored over out-of-state entities. The Tennessee retailers — who, unlike the national association, favor the residency requirement — argue that the Granholm decision applies only to wine producers, not to retailers. If the court accepts that argument, it will end immediate consumer hopes of regaining access to a wider selection of wines. Richard L. Colbert, a lawyer for the Tennessee retailers, declined to comment on the case. But Mr. Clement, who served as United States solicitor general from 2005 through 2008, asserts that Granholm should logically extend to wine retailers. Another recent case, Lebamoff v. Rauner, also challenged restrictions on interstate retail shipments. In that case, the Court of Appeals for the Seventh District, in Chicago, rejected the argument that Granholm drew a clear distinction between producers and retailers. The importance of that opinion, though, will depend on how the Supreme Court rules in the Blair case. Because of the arcane nature of the case, it is difficult to speculate along political lines what the court will do. Of the nine justices in the 5-to-4 Granholm decision, only three remain: Justice Clarence Thomas, who dissented, and Justices Ruth Bader Ginsburg and Stephen G. Breyer, who sided with the majority. Ultimately, the case is a reminder of the tortured relationship that the United States has had with alcoholic beverages since the passage of the 21st Amendment, which ended Prohibition in 1933. That amendment left it to each state to impose its own laws and regulations, which makes the distribution of wine in the United States so difficult and confusing. In addition, producers nationwide are required to sell to retailers by way of wholesale distributors. This three-tier system vests great power in wholesalers, who have opposed any efforts like Granholm or Blair to expand consumer access to wine. The Granholm decision was the first to chip away at this archaic structure. The Blair case may be one more step toward freer access to fine wine.